255 in stock Need More ? 21 cm xxi, 307 p.
What would happen if a top expert with more than thirty years of leadership experience was willing to distill everything he had learned about leadership into a handful of life-changing principles just for you? It would change your life!John C. Maxwell has done exactly that in "21 Irrefutable Laws of Leadership". He has combined insights learned from his thirty-plus years of leadership successes and occasional mistakes with observations from the worlds of business, politics, sports, religion, and military conflict. 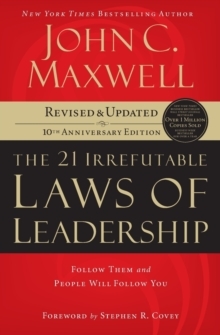 The result is a revealing study of leadership delivered as only a communicator like Maxwell can.